Trinidad And Tobago's latitude and longitude is 10° 2' to 11° 12' N and 60° 30' to 61° 56' W . Below is the map of Trinidad And Tobago showing major towns, roads, airports with latitudes and longitudes plotted on it. The island nation of Trinidad and Tobago is geographically located in the West Indies, the geographic coordinates of which are situated between 10° 2' and 11° 12' N latitude and 60° 30' and 61° 56' W longitude . The original name for Trinidad was the Amerindian Kairi meaning the Land of the Hummingbird. Tobago was called as the Bella Forma by Christopher Columbus. 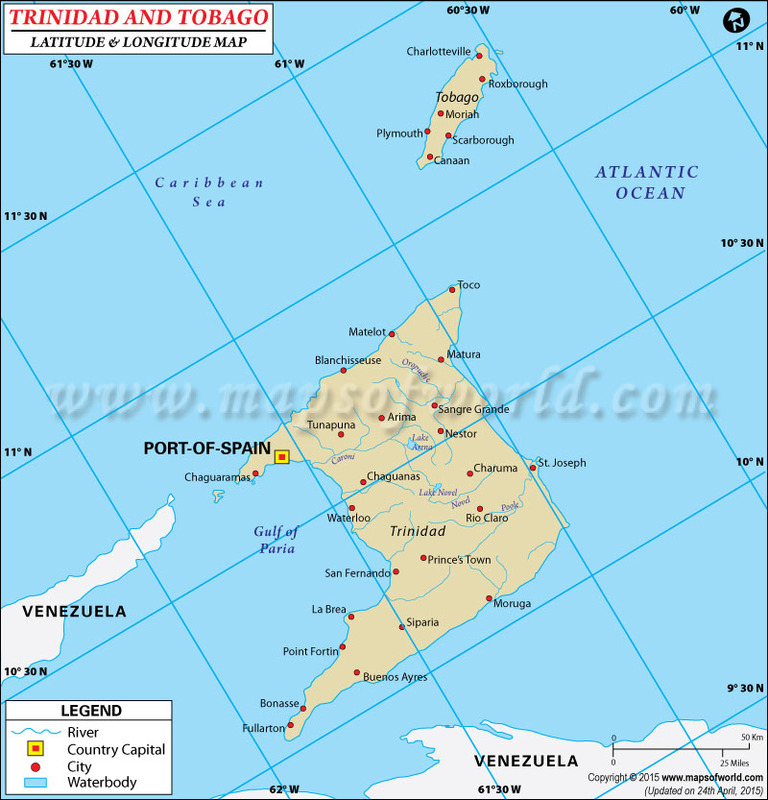 The capital of the islands is at Port of Spain with geographic coordinates of 10°40'N latitude and 61°31'W longitude. The largest town in the Trinidad and Tobago Islands is the Chaguanas. The geographic latitude and longitude spans across an area of 5,128 sq km. The people of Trinidad and Tobago are referred to as Trinbagonians or Trinis. The latitude and longitude of Trinidad and Tobago houses a population of 1,305,000. The main language spoken is a version of pidgin called English Creole. Ethnically, the population consists mainly of people of African, Indian, Chinese, Arab and Syrian origins. There are also mixed races called the Cocoa Payol who descend from a mixture of Spanish and Venezuelans settlers in the region.